Don’t let anyone tell you killing off men’s body hair is easy. Sun Tzu said, “the supreme art of war is to subdue the enemy without fighting”. However, our approach is to use an overwhelming force. Our Elos Plus diode lasers pack a hair-destroying punch. These are dual-energy beasts made by Syneron Candela, the world’s leading aesthetic device manufacturer, and have been designed specifically for killing off hair follicles. Men’s body hair is tough, usually thicker and more deeply set than woman’s hair and the higher powered lasers we have are needed to get the great results we get. Small warning however – our lasers are a bit more hurty than the weaker machines, so you may need to grin and bear it. Kapow! Laser Hair Reduction Prepay SALE! This is a small selection of treatment areas (and all areas are on sale). Pricing is per treatment when 4, 6 or 8 treatments are prepaid. More information provided at your consultation. Have a question about mens laser hair removal? If we haven’t answered it in the FAQ’s click the button to ask us something else. We will email you a private answer. Why are we the best for male laser in Wellington? We have been doing male laser hair removal longer than anyone else and have invested in laser technology made by Candela, the global leader in laser hair removal, that’s powerful enough for the tough male hair. The quality of our machines, the depth of our training and expertise and our uncompromising hygiene and client safety is what defines us as a business – every single day. Laser permanently removes hair by destroying the active matrix (the germ cells that grow hair found deep inside a hair follicle) using heat. The trick is to get enough heat down there under your skin without also burning your skin. That’s why the quality of the equipment and skill of the operator are really important. Unfortunately not everyone is. Our laser equipment can treat all skin colours (most can’t do this) however the colour and type of your hair matters. Lighter coloured hair; blonde, grey, white or red generally gets poor to zero reduction and the thin fluffy hair (mostly on the face), even though dark, is also unlikely to have good results. There are also many contra-indications to laser which mean you can’t be treated, e.g. recent sun tan, taking medication that increase the skin’s light sensitivity such as Accutane and many others which will be discussed at your free consultation. For the technically minded our lasers are called Elos Plus from Syneron/Candela. These are multi-platform devices (translation: do lots of stuff) and for hair reduction use dual energy technology combining diode laser at 810nm wavelength (light) with RF (an electric current). Elos actually stands for Electro Optical Synergy. Diode laser is considered to give the best hair reduction results (but is not so widely used because it costs more to run and can be a little more painful). RF is an electrical pulse fired out from 2 x electrodes in the laser head at the same time as the laser. The RF provides an additional heat source without needing colour in the hair to work. It’s useful as a way to reduce the risk of burning from the laser and provides instantaneous temperature measurements under the skin significantly increasing client safety. What type of lasers do other clinics in Wellington use? Caci Clinics – use Energist IPL equipment. This is not a laser however Caci refer to their service as “Laser Hair Removal”, which is a bit naughty. Courtenay Clinic and Off Wax & Laser – both use the same Candela GentleLase technology. These are real lasers with two outputs; the GentleLase Pro Alexandrite 755nm (for lighter skin tones) and GentleYag Pro Nd Yag 1064nm (for darker skin tones). This technology is the cheapest to run and is widely used in Australia by Laser Clinics Australia to provide highly discounted laser treatments. Avana – use Candela GentleLase Pro a real laser using Alexandrite laser technology at 755nm. This laser is effective for lighter skin tones (up to Fitzpatrick III) but is not recommended for darker skin as it can cause hypo-pigmentation (white patches). Skin Deep Laser in Lower Hutt – use a Quanta Alexandrite 755nm laser made in Italy for laser hair removal. Vein & Skin Clinic in Mt Victoria, Wellington – use a LightSheer diode laser 800nm an older version of a device very popular with Aesthetic doctors in the USA. Other clinics – all other clinics in Wellington (as far as we know) do not have real lasers and use IPL equipment. Sadly many of these clinics still call their services “Laser Hair Removal”. Everyone must have a 20-30 minute consultation prior to receiving any laser treatment. It’s where we will assess your suitability for laser and give you feedback as to what results (percentage hair reduction) we think we can give you. Your medical history will be taken to check you are medically suitable. (Bring along a list of any medication you are taking). The treatment area and type of hair growing in the area will be checked (often by plucking out a hair to examine its follicle root). So it’s best if you stop shaving a day or so before and don’t wax or pluck for a while (sorry). The hair growth cycle will be explained (see details later in this section). A Personal Treatment Plan will be provided giving you pricing and payment options. Our Personal Treatment Plans are a written commitment by us informing you of the results we think we can give you (the amount of hair we will clear expressed as a percentage hair reduction), how we will guarantee this, the number and frequency of treatments we think you will need to get that result, the price for treatment and the payment options available. We want to get you a good result and our guarantee comes from your reasonable commitment to attend all the treatments we prescribe at the time intervals given and follow the before and after care advice. Our estimate of your final hair reduction results is based on our experience and understanding you will follow the plan however as with any medical procedure there can be reasons where further treatments over a longer period may be required. Our guarantee provides those extra treatments, for up to a year, at no extra cost to you. Not all hair in the treatment area is treatable at the same time so more than one laser treatment is needed to get all the hair. To understand laser hair removal you need to understand the hair growth cycle which is this – in any part of your body hair grows for a while (anagen), stops growing for a while and falls out (catagen), rests for a while (telogen) then starts growing again. Unfortunately it’s not synchronised with all three things happening with different hairs all at the same time. It’s a bit chaotic really. It is only during the active growing phase (anagen) where the laser permanently disables hair growth because that’s when hair is actually connected to the active matrix (germ cells that grow hair and other structures down there) allowing enough heat to get to the right bits. The amount of time hair is in growth phase (anagen) is different in different parts of your body, e.g. on your head 2 or more years (hence longer hair), on your face 4-6 weeks, body 6-8 weeks and legs 10 weeks or more. The period of time hair is anagen is used by us to determine how many weeks between each laser treatment (so we get the maximum growing hairs each treatment). Initially we will set your treatment times at the average but once we start seeing how your hair is responding to treatment we may increase or decrease the times between treatments. To get the best results from your investment in laser hair reduction it’s very important you stick to the treatment times we prescribe for you. Yes, there is plenty of independent medical evidence from studies conducted in controlled conditions concluding that laser permanently stops hair growing. We also have thousands of clients satisfied with their results. However it’s not as simple as that. This is best discussed at your consultation or for you to do more research but firstly not all hair is removed from the area, that’s why we call it hair reduction. And secondly hair may grow back in the area treated. Not usually the same hair but over time (usually years) more hair can grow in the treated areas for various reasons. It’s a good idea to understand why this is before spending your money and being disappointed later. It can be painful. And our diode lasers are very powerful meaning they can be more painful than other lasers or IPL. We have ways to manage the pain including a cooling device to cool & numb the skin so you don’t have to feel the heat from the laser as much. If the pain worries you ask for a patch test at the consultation and check it out for yourself. This is the question asked most often and sadly one we can’t answer without physically seeing you in a consultation to assess the area and the hair to be treated. But generally we think around 8 treatment sessions are a good average and top up maintenance sessions may be required in later years. After a laser treatment session your skin will probably feel hot and look red because we have added considerable heat to the area. We also aim to give you temporary swelling around the base of the hairs indicating they have been successfully targeted. This should settle down within 48 hours. It is possible to get a superficial burn with risk of hyper or hypo-pigmentation, darkening or lightening of the skin. In most cases this will disappear within 10 days. Why laser? IPL is so much cheaper? Lasers get much better hair removal results than IPL. The lasers we use are designed specifically for hair reduction. IPL has a wider range of uses and is generally better for skin rejuvenation treatments because it has a much shallower skin penetration. Our Elos Plus machines also have a separate IPL applicator which we use for skin treatments so we have good experience in this. We would never use our IPL functionality for hair removal. Clinics who offer hair reduction using IPL do so because these machines are much cheaper to buy than lasers (as much as 10 times cheaper). These are the machines that have hair reduction treatments offered at super discounted prices. They can get some results but best avoided. IPL, often mistakenly referred to as a “laser”, stands for Intense Pulsed Light. 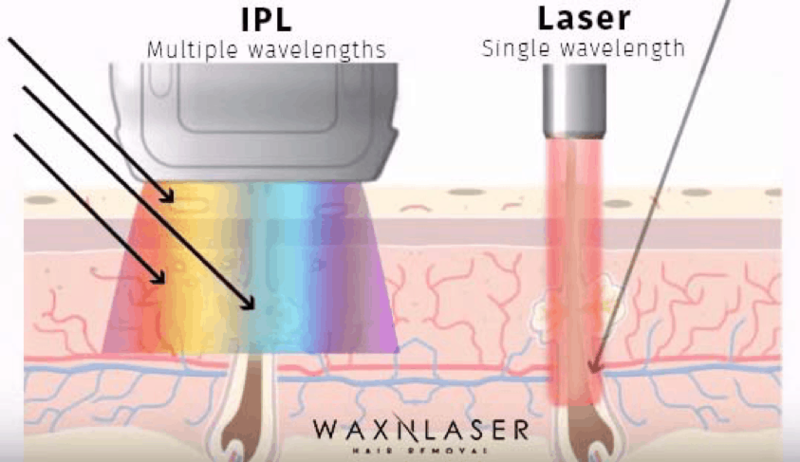 IPL is a broad spectrum light spread over the whole treatment area compared to a laser with a concentrated single wavelength of light providing far more concentrated energy. Laser is more focused and better for targeting hair follicles. Can you get Laser Hair Removal over Tattoos? No. Laser will respond to the pigmentation in the tattoo and it will heat up. This can not only ruin the tattoo but can also badly burn you, turning into a scar. We can work around a tattoo but please make sure you tell us about it during your consultation. Here’s some great advice: if you can wait, have your course of laser hair removal (6-9 months) before you ink up and your tattoo will look even better on a hair-free background. Instalments – you may pay in weekly, fortnightly or 4 weekly instalments without interest or fees. Up Front – if you choose to pay for the full course upfront we offer a 10% discount. Single – you may pay per session. It’s slightly more expensive but you can stop whenever you choose. Guarantee note: our guarantee requires you to complete the entire recommended course of laser treatments and the guarantee will be invalidated if you stop treatments early.